Wash gloves by hand in warm water (no softeners or bleach). To dry them, do not place them on a heater or in the sun, the best thing to do is press out any water, starting at the fingertips and squeezing down carefully to the wrist opening with the opening pointed down. Store gloves in low temperatures in a dry environment. Surface dirt can be cleaned off with lukewarm water and a brush. When treating exterior surfaces, avoid products containing oils or greases since these can impair the breathability of footwear. For sand, gravel and other dirt on the inside, just remove the footbed and shake out any dirt. For both bindings, there is an adjustment plate that can be mounted underneath the heel unit. The adjustment plate can be found either by ordering it at dynafit.com/en-us/ or at your favorite Dynafit retailer. For mounting, it is best to head to your nearest Dynafit retailer. Locate your store here. Which backpack is the right one for my activity? 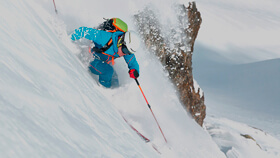 How should I apply waterproof treatment to my DYNAFIT apparel? After you have placed an order in the Dynafit Online Shop, you can unfortunately no longer change it. However, we accept returns up to 30 days after the order has been placed. Click here. All products will be shipped within 1-3 business days after the order has been received. The estimated delivery times given are however related to the day a package is transferred to the delivery service.